I feel like I'm back now and getting back into my blogging. I've been taking photos of things to blog and also thinking about new blogging ideas and also I've floated around the idea of YouTube. What do you think? I had a little bit of a low in the middle of the week, but I perked up after a great Thursday and now I feel like I'm back to my normal self. Maybe I needed to hit that low to spring back up again! Isn't that weird? Fan Flower Playsuit - I saw this recently in the Oasis window and fell in love with it! I didn't know Oasis did playsuits, but it's just really pretty with it's oriental styled print and I also love the style: it's fun and easy to wear. I wish I had the £50 to spend on it! PREMIUM Paige Woven Boots - My red boots are ready for it's last walk. The heel is worn to and the colour is coming off not only the heel but the boot too. They're super old and I can feel the fabric weakening too. Maybe I need to invest in some pretty sturdy red boots like these pretties from Topshop! Maybelline Colour Tattoo 24hr - I love my little pot of gold colour tattoo. The colour lasts all day, and vivid as when applied as well as lasting pretty long with minimal product for each application! One in each colour please? Black Biker Stitch Jacket - I am finally admitting I need one of these in my life. I don't know what to wear when a cardigan isn't suitable, or a denim jacket. Or when it's not cold enough for a coat. This thing could save the day every time. DESIGNED BY Peacock Wedge - I need a pair of pretty new shoes for my aunts wedding vow renewals in August. Now I know I shouldn't be stealing the show because it's her big day but I would LOVE to wear these for it. Or maybe buy them and eventually wear them for my own wedding whenever that may be. The new Miss Selfridge Designed By collection is absolutely to die for with their amazing white premium pieces! Midi Bodycon Dress - I love a midi dress right now. Can I say that only owning one midi and a midi skirt? I think I can... I want another. This please? Those two dresses are fabulous! 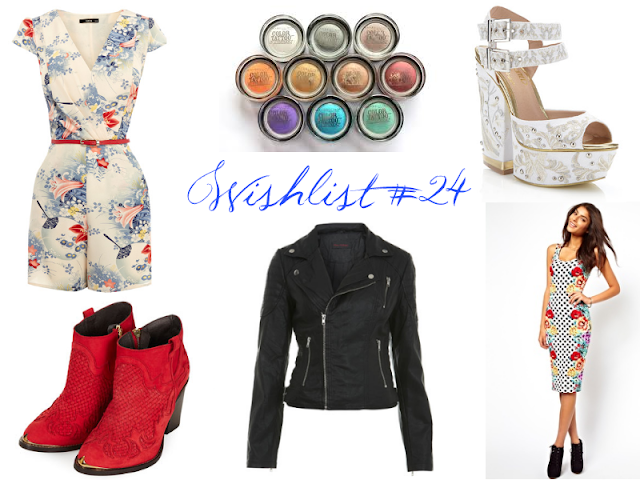 Great wish list, and happy 3rd blog birthday for tomorrow !! !